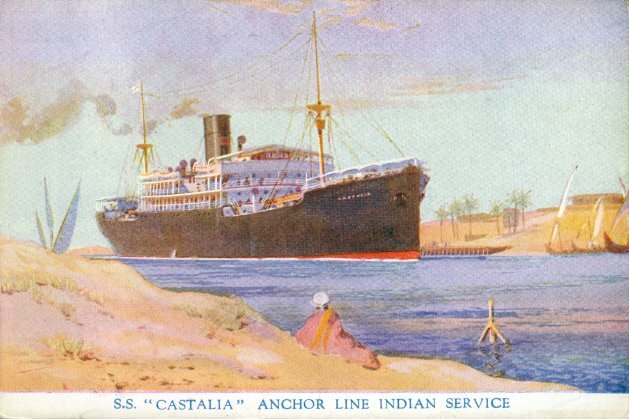 Anchor Line's second Castalia was built by Barclay, Curle & Co., of Glasgow. Launched in August 1906, she took her maiden voyage, from Glasgow to Bombay, on 11 October of that same year. With some few exceptions, she remained on that service until 1948, although she was operated the Government during both World Wars. During World War I, she also made a number of trooping voyages. In April and June 1921, she made her only two North Atlantic sailings, from Glasgow to New York. In January 1949, Castalia was sold to S.A. Co-operativa Garibaldi of Italy. Renamed Marengo, she served on a Genoa-Caribbean service. She was sold again in 1950, to Fratelli Grimaldi, renamed Urania II, and served Central America from Italy. She was sold for breaking up in Japan in 1954, but problems with obtaining an import license resulted in her being scrapped in Italy instead. Castalia's sister ship was Elysia.